So its been awhile but Im back on the block or blog even. London has been in the limelight a great deal recently. There was some sort of sporting event called The Olympics which everyone seemed to get very excited about, so much so even The Queen got involved and did a freefall from Space into the Stadium or was that another guy? Either way Im sure they used a goPro. They got even more excited when one of the athletes a sprinter I think (Bolt ? ) won a race, grabbed a camera and started taking pictures of the crowd! Actually his shots came out pretty well, & surprisingly there was no motion blur! Still, away from the action, and out on the streets the kids have been quietly (and sometimes illicitly) getting on with doing what they do best; Grafiti. Banksy has got a lot to answer for, and i don’t mean that in a negative way. When i were a lad grafiti was called vandalism, and rightly so. It was usually just a mindless, hastily spray canned signature, or sometimes if the proponent was feeling especially literate that day, a statement confirming the fact that the signaturee “was here”., or the “LFC” were “Forever”. Exciting stuff. the closest it got to being artistic was if the proponent used different colours for the name and the statement parts. Occasionally the artist would really extend his talent and show his sense of humour by adding a ‘Kilroy’ face, (nose & eyes ) with hands appearing to grasp the top of the wall. Google him, and take a look. Whether your impressed or not you may be more impressed when you learn that his work now sells in international Art Galleries for thousands even hundreds of thousands of pounds/dollars. Not bad for a bad boy from Bristol. This shot isnt a Banksy. At least I dont think it is, its getting so much harder to tell these days as he has so many imitators. But I like it anyway. I was with my gun /military obsessed 6 year old son when I saw it. He didnt really appreciate the illustration and subtle commentary on child soldiers, pressing me (yet again) on when/if he could join the army. I patiently explained (again) that in this country at least and for the time being (at least), he would have to wait, and quickly took the shot before we got arrested. 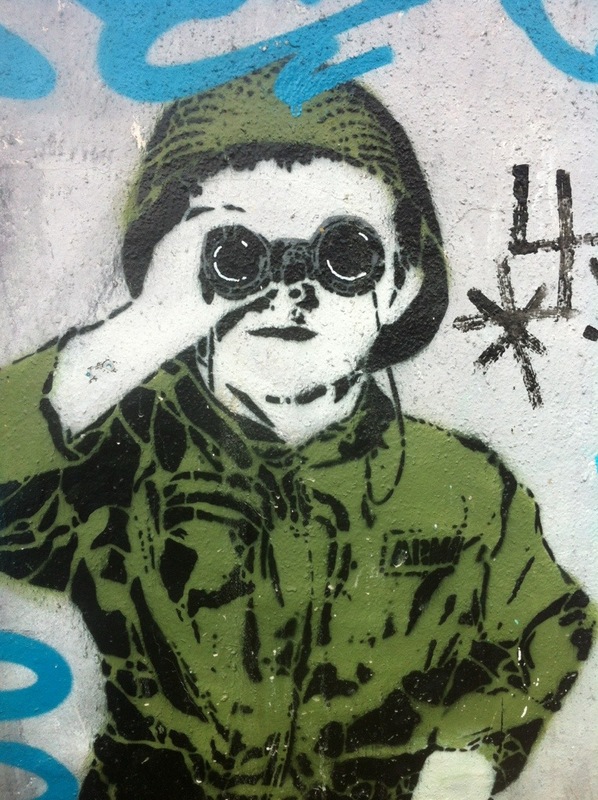 This entry was posted in Graffiti, Street and tagged child soldier, Graffiti, street, street art, urban by Meelius. Bookmark the permalink.